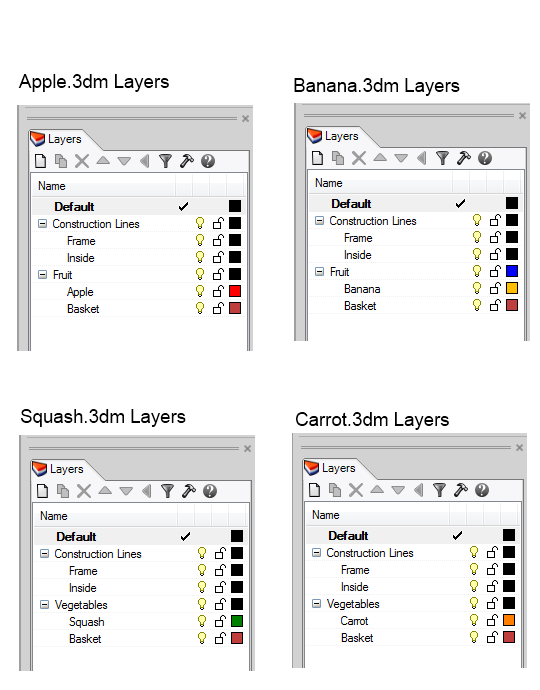 Rhino 5 allows sublayers to have the same layer name, shown in the example above. 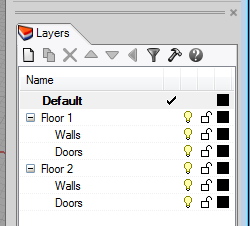 In the example there are two sublayers named Walls and two sublayers named Doors. Some Rhino users requested this ability to have sublayers with the same layer name to help them organize layers to make it easier to find similar small features in a large model. Other users have designed their work flows and parts libraries assuming that there are no duplicate layer names. 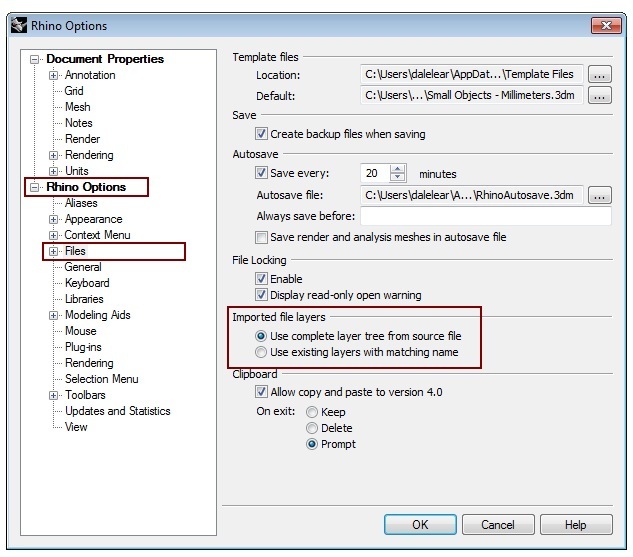 If you are one of these users, the section below explains how you can configure Rhino so it will not create duplicate sublayers when importing models. For some users, having more than one layer with the same name disrupts their workflow. So Rhino 5 lets you control how layers are combined when Rhino imports an external model into an existing model. The Rhino Options > Files tab in the Options command dialog offers two options for managing layer names. Use complete layer tree from source file Rhino will create a copy of the imported model's layer tree in the existing model. Use existing layers with matching name If a layer in the existing model has the same short name as a layer in the external model, Rhino will add everything on the external layer to the existing layer. 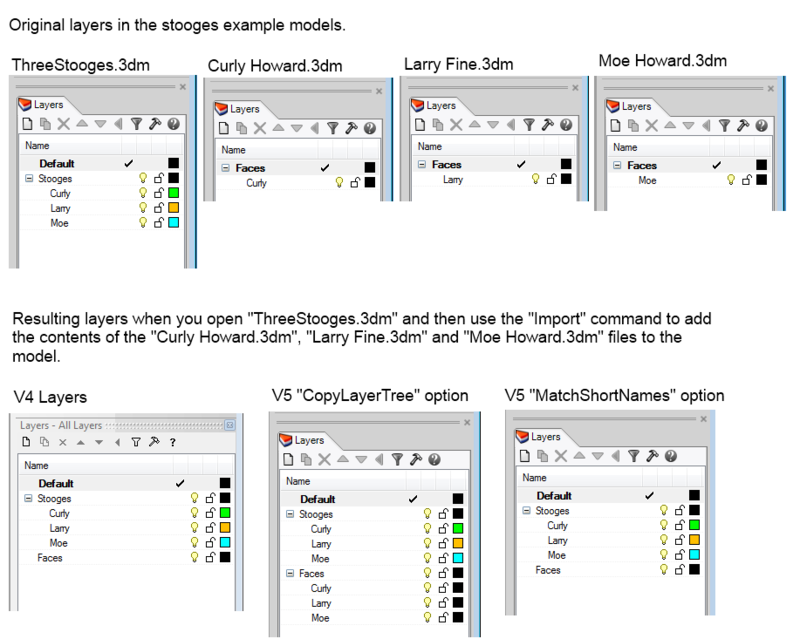 Below is an example that shows what happens when you open a model named ThreeStooges.3dm that has empty layers named Curly, Larry, and Moe and then import geometry from models named Curly Howard.3dm, Larry Fine.3dm and Moe Howard.3dm, which respectively contain layers named Curly, Larry, and Moe. You may download the files used in this example from stoogesimportexample.zip. Active All layers for the linked block definition are in the active model and are saved in the active model. All layer attributes, including rendering material, can be edited and are saved. For each layer in the reference model, if there is a layer in the active model with a matching short name, then that active layer is used. Otherwise an active layer is created. Reference The layer tree from the reference model is added to the active model as reference layers under a grandparent layer that has the name of the reference file. All the added layers are reference layers. You cannot change the reference layer settings except for the visibility, locked, and color settings. 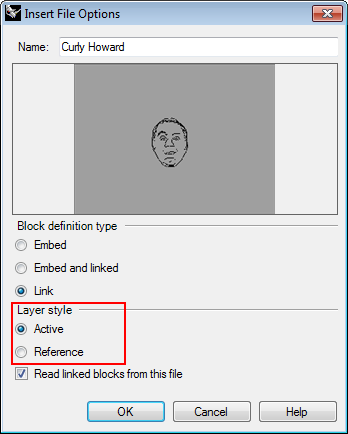 This image shows where you specify the linked block definition layer style when creating a linked block. You may download the files used in this example from producelinkedblockexample.zip. 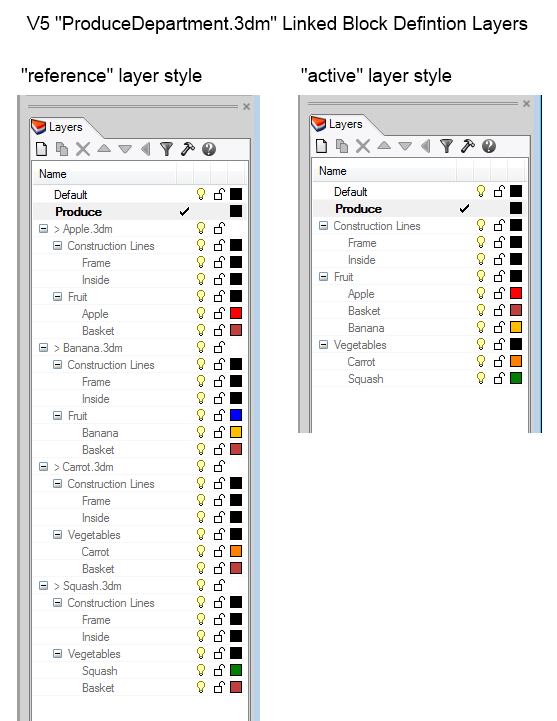 This example demonstrates the two ways Rhino 5 manages layer names for the contents of a linked block definition. The model called ProduceDepartment.3dm has four linked blocks that reference files called Apple.3dm, Banana.3dm, Squash.3dm, and Carrot.3dm. Back to Rhino 5 Status.